Thailand is in the thick of it at the moment, what with a severe border clash with neighbour Cambodia and lots of rumours of a new coup. The latest clash between the neighbours started last week and has seen five straight days of fighting. The fighting started a distance from the Phra Vinear Temple which has been the focus of clashes in the past. 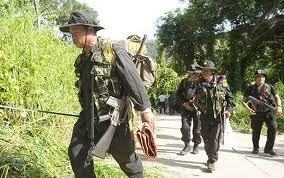 Thailand claim Cambodian troops moved into an area which hasn't been officially demarcated. 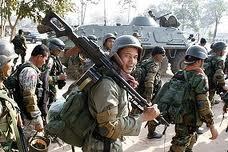 The cambodians say that they were only defending their territory from advanced patrols sent out by Thailand. Like every conflict it is the civilians who suffer the most, with casulties and evacuations on both sides of the border. Unfortunately, Thailand is reluctant to have any independent troops on Thai soil, a condition that cambodia is demanding. This as given Cambodia the moral high ground in the eyes of the world and they are making full milage out of it. All this is going on in the back drop of a rumoured coup in Thailand. This week two Regiments have paraded in Bangkok to express their loyalty to the generals and the Monarchy. The same thing happened the last time their was a coup (2006). The Army has instructed the courts to charge several opposition MP's and intellectuals with Lese majeste. This is a law which forbids any critisism of the Monarchy and the Royal Family and is sadly used as a political toy to beat undisirables with. Finally, a least a dozen Red Shirt radio stations in bangkok have closed down and earlier this week the thaicom satalite went down for several hours. Some say as a rehersal for a coup, the official line is that a computer filure caused the downtime. I hope there isn't a coup because this is the last thing Thailand needs. Thailand needs a coalition unity Goverment and the needs of its people should come first and the greedy rich need to let go of some of Thailands wealth. Songkran is the Thai new year and involves a week long nationwide carnival, were Thais really let their hair down. If you don't want to get wet or join in the party spirit then this is not the time to visit Thailand! 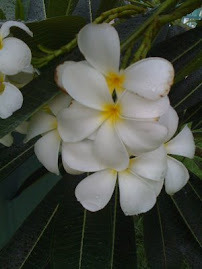 I've done a couple of Songkran's and after the 'TH time if getting wet the enjoyment dissipates quickly and the yearning for a quiet life takes over. It's definately a Thai thing! This is by no way a criticism but how hard Thais work in their normal life, this is one of the few chances they have to blow off steam. This years festival will be more poignant due to many of the celebrations being called off last year due to the political protests in Bangkok. So it's double thus year!!! Hopefully not double the deaths that occur over the holiday period. Over 500 people are routinely killed in road accidents alone over Songkran, it's carnage. 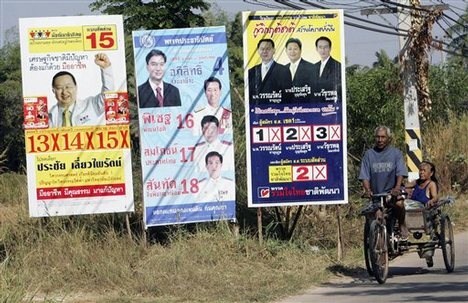 At any time in the next few weeks, the timing of the next General Election in Thailand will be known. With all that Thailand as been through in the last 3 years, this election is eagarly awaited by all parties and colours and will decide which possible road Thailand will go down. The Democratic Party are in control of the Government at the moment and are associated with the Yellow shirt PAD movement who bought about the demise of the last Non Democratic Party government. However over the last few months the Dem's and PAD have grown apart, the Dems haven't played ball over a border conflict with Cambodia. In all fairness the more distance between the PAD and the Dem Party, the better the chance of re-election for them. On the other side of the coin is Puea Thai, PT are closely related to the Red Shirt movement in Thailand. The red shirts are the mouth peice for the outsed former PM Thaksin Shinawatra. The Red Shirt were the group involved inlast years street demonstrations in Bangkok that saw nearly 100 people killed. The Red Shirts and PT have done a good job since then re-inventing themselves as a peaceful protest group. What ever happens I only hope it passes of in a peaceful and fair manner, all the polls that have taken place put the Dems and PT in a 50-50 shootout. It will also be interesting to see if the looser will except the outcome, not a Thai political trait. Also going by the trend in Thailand for the easy flare up of political tension I hope the main activity of the campaign is after the middle of June and we are safely back home. This is a very left field post, but I'm sick and tired of Disabled parking spaces! We went to Derby Westfield shopping centre this lunchtime and the main car park level was chockabloc. All 12 of the parent and toddler spaces had long gone and we got the last avaliable space in the normal parking. This left around 50 disabled parking spaces. Of these there were only 3 being used and the rest were being marshalled by a real Jobs worth threatening people with a fine if they park in the disabled spaces. When we arrived back from shopping an hour later the car park was still full apart from the 40 or so disabled spaces that still no one had used. Someone really needs to review the number of spaces that are allocated to disabled drivers. The only parking spaces outside Elizabeths Nursery are disabled, I use them when I drop them off at 7.30am in the morning. I'm only in the space for a few minutes. last week when I came out of the Nursery one of the new style Hitler storm trooper traffic wardens was in the process of writing me a ticket. There were four spaces left and I'd been in the Nursery about three minutes. I told the idiot this and he said I would have to prove how long I'd been parked there. Unfortunately for him I could prove it, my Van is tracked by my employee, so all it would have taken was a quick phone to show him. Amazingly he backed down. Also, why is it that at many car parks, disabled drivers get free parking? I'm sure they probably have more money than me, but I have to pay. Part 1 of the moan over. Over the last two weeks, Thailand has experienced two savage natural disasters. This week the south of Thailand, they experienced an early monsoon with some areas getting there years rainfall in less than 48 hours. On some islands the Thai Navy had to be called in to rescue tourists off them and the Airport and ferry services to Koh Samui were cancelled due to bad weather. This stranded 1000s of holiday makers. 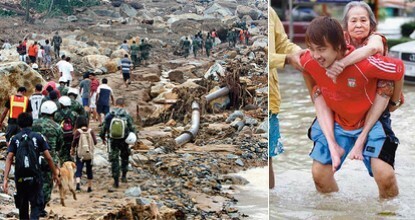 Sadly several village's were washed away in flash mud slides, the death toll could be as high as a 100. 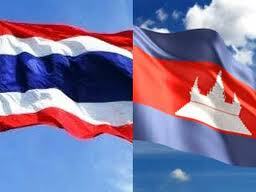 Thailand will get over all this, after the 2004 Tsunami, things will have to get bad to beat that.